Preheat oven to 400F and line a baking sheet or grease it well. Slice your pears in halves or quarters. Remove the stems. In a small bowl, whisk together 2 tbsp honey, 1 tbsp balsamic vinegar, 1/8 tsp cinnamon, and pinch of ground nutmeg. Brush this over the pears, evenly. Place pears in oven for about 20 to 25 minutes, until soft and pears are browned on bottom. If you are using larger pears, they will take longer to roast. Steckler Pears take closer to 22 minutes. Add puréed pears to large glass pitcher or glass serving bowl. Let it chill before serving. 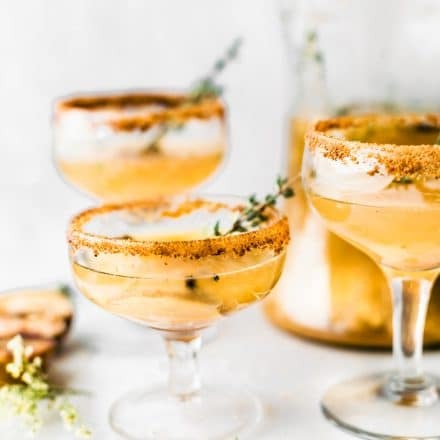 Once ready to serve, add a pinch of ground clove, 3 to 4 more tablespoons of honey, 24-28 ounces sparkling white wine, champagne, or sparking white grape juice to the pitcher or bowl. Stir together. Optional 1 ounce of vodka if you would like the sparkling cocktails less sweet with a bolder liquor flavor. Coat wine classes or cocktail classes in brown sugar or coconut sugar. Then pour 5- 6 ounces of the sparkling cocktail mix into each class. FOR MOCKTAIL, sparkling white grape juice or apple juice works best. NOTES for champagne option: I found that you don’t need the vodka if you are using champagne. It’s flavorful enough with just the champagne. If you are adding the optional 1 ounce of vodka or whiskey, adjust to your taste/liking. Add more honey if desired. For Whiskey, be sure to look fo gluten free brands. Honey Roasted Pear Sparkler Cocktails Break in the holiday season with these festive Fall Cocktails and Mocktails!